In 4 collaborative building days we went from idea to reality together with engaged students from 2.z. 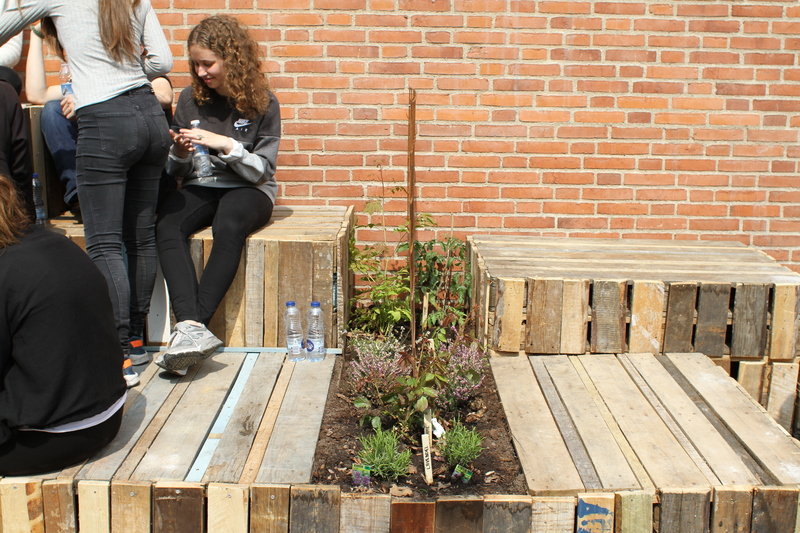 Jointly we transformed a small, forgotten, dirty site on the edge of the Johannes Highschool property into a new social outdoor space and an alternative learning space – everything made out of recycled materials and spiced up with all kinds of (edible) greenery. The project is a continuation of last year, where students came with different design proposals for spaces around the school that they wanted to change to the better. This year we took it one step further – the students were involved in both designing and building the site. The site was a 68m2 space, which used to be a smoking shed – The school wanted to transform it into an open and multifunctional space, that could give the students an outside area for hanging out and outside teaching. Through seminars, workshops and the use of different tools students from 1.z and 2.z designed the perfect urban space that fitted their everyday needs. The project was interdisciplinary involving biology, social studies and English. But most importantly the students achieved skills outside of the school curriculum. They learn by doing by going from theoretical to practical level –building the site with their own hands! And why not use the transformation of the site as part of a learning process? Sustainability was in the center of the project, and we had a fruitful collaboration with Alba Nowik Production and Repos from the Goldmine in Vasbygade. 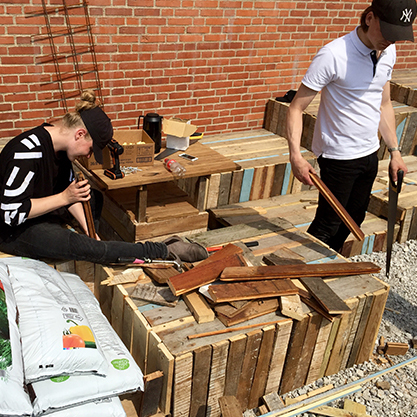 It gave us a fresh and concrete perspective on upcycling. The Goldmine is an experiment started by Copenhagen Municipality and Amager Ressource Center that operates the city’s recycling centers. The Goldmine has 12 projects, who works with circular economy, where resources and raw materials becomes part of the value chain again and again. Read more on http://guldminenkbh.dk/. 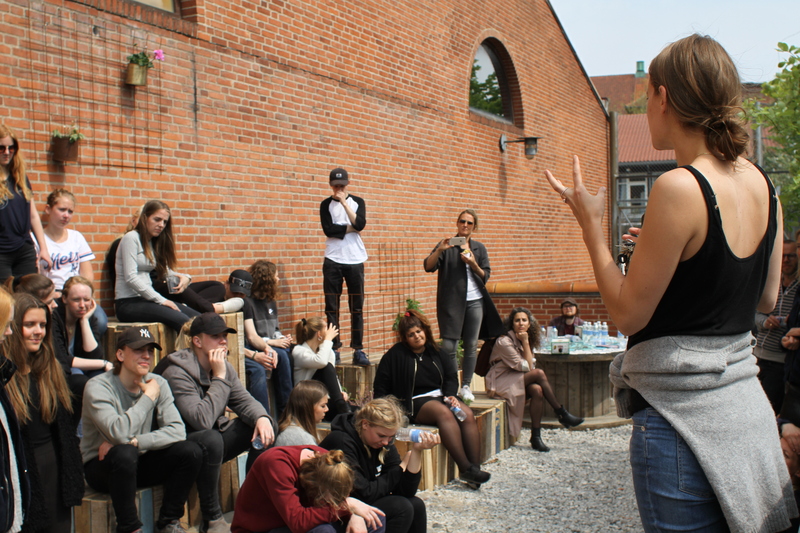 We wanted to equip the students with the right “ recycled glasses” to look at the world from the beginning, and Alba Nowik Production was a part of the first seminar to explain the potentials of recycled materials and why the perspective is so important in architecture and design. Later in the process Alba Nowik Production made a workshop at the Goldmine, where the students could experience the different materials. It sparked inspiration and gave them an understanding of the many possibilities instead of limitations. The students learned that it brings something new and different to the design. After the workshop at the Goldmine we went back to qualify the material so it became a comprehensive proposal tailored to location, budget, time and wishes from the students. With arki_lab’s focus on the translation of ideas into concrete sketches for our projects – we are always trying different techniques that ensure citizen’s voices appear in the final design. We’ve learnt this high level of involvement is pivotal in the survival of the site and the design due to notions of ownership, responsibility and functionality. The final physical design is always essential when doing user-involvement because there are so many needs to take into account. The students need to be guided through all the steps and every design proposal must be explained and communicated. We looked through the different design proposals from the 2-days workshop at the highschool and the workshop at the Goldmine and picked out the most central ideas. Through internal collaborative workshops at the office we developed two different suggestions, and made a small online survey to get the final feedback. They could vote on the suggestions and also give comments on the overall design, process and use of materials. The most popular suggestion from the survey served as a collective frame for the building days, but it was still open for new inputs and small corrections. The students were engaged in the whole transformation of the site from putting out gravel to the last detailing with smoothening the wood and getting all the plants ready. Slowly the area got build up and the students got to work practically in a new way. It challenged them in a new way and new dynamics and synergies appeared. Repos from the Goldmine was a part of the process the whole week providing us with recycled materials and guiding the students in different design solutions etc. Our new collaboration with the Goldmine made it possible to experiment, recycle, upcycle and create new innovative solutions on site! A big thank to the students and teachers from 2.z and, for the support from the Danish Art Foundation and Johannes school.